Robotics Corporation. These three vehicles are from the United States of America and have the ability to do studies in glide mode. These vehicles glide slowly down to a specified depth and then back to the surface using a buoyancy control system tracing a saw-tooth profile, observing data such as temperature and conductivity versus depth. 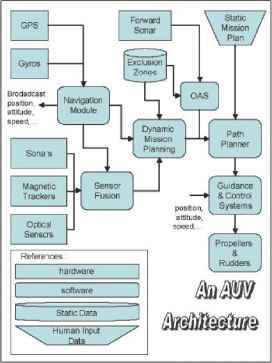 When the vehicle is at the surface, positioning is obtained via GPS and communication between the vehicle and the home base is via satellite. The three gliders are small semi-torpedo shaped AUVs that control their forward motion by the glide path taken and changing buoyancy. Wings allow steerable gliding, thus horizontal propulsion. Fig. 1. 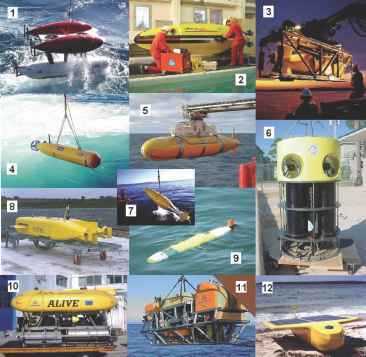 1) Woods Hole Oceanographic Institution, USA: Autonomous Benthic Explorer (ABE), 2) ECA, France: ALISTAR 3000, 3) Boeing, Oceaneering and Fugro, USA: ECHO RANGER, 4) Bluefin Robotics, USA: BLUEFIN 21, 5) Southampton Oceanography Center, Great Britain: AUTOSUB, 6) Florida Institute of Technology, USA: TUVAAQ, 7) Kongsberg-Simrad, Norway: HUGIN 3000, 8) Atlas Maridan, Germany: M600, 9) Hydroid, USA: REMUS, 10) Cybernetix, France: ALIVE, 11) Cybernetix, France: SWIMMER, 12) Autonomous Undersea Systems Institute, USA: SAUV. The Slocum glider, the Seaglider and Bluefin's glider Spray are excellent at the tasks they are designed to do (i.e., very long term, very little power, slow cruising of the ocean's water column), but they are limited as to the type of payloads they can carry, and they have no active propulsion for times that require more than buoyancy thrust (e.g., control of the vehicle at the surface). These autonomous underwater gliders each change their buoyancy to be able to travel horizontally in the ocean's water column using the lift on their wings, like a normal glider does to convert vertical velocity into forward motion. These vehicles are not capable of traveling in a horizontal path as would a typical propeller vehicle but follow a saw-tooth path as the vehicle descends or ascends. These three underwater gliders were designed specifically for long term sampling and easy deployment and recovery by a minimal crew (i.e., one to three people) on any size boat or ship. Consequently, this requires a design that has minimal space for instrumentation and is limited in its function/capabilities. These vehicles are relatively inexpensive, typically less than the cheapest powered AUV's (e.g., $100,000 for the EcoMapper AUV by YSI Inc.), costing less than a week and a half of ship time for a research vessel. With respect to these gliders four basic sampling modes exist: 1) vertical sampling where the forward motion of the vehicle counters any local currents to maintain position, 2) horizontal saw-tooth sampling where the forward motion allows for the vehicle to obtain information both vertically and horizontally, 3) array sampling where multiple gliders form a distribution of sampling instruments covering an entire region, and 4) long life and repeat sampling over an extended duration. 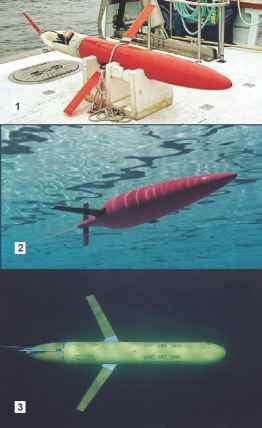 The Slocum Battery (Webb et al., 2001) and Spray Gliders (Sherman et al., 2001) have been optimized for missions in shallow coastal environments. Each of these vehicles uses battery power to control the buoyancy. • Range: 3500 to 4700 km depending on the glide ratio. The Spray glider (see Figures 3 and 4) is similar to the Slocum Battery Glider but with a more hydrodynamic shape giving it about fifty percent less drag than the Slocum Battery (Sherman et al., 2001). The Spray was targeted for long-range up to 4700 km and down to 1500 meters depth by optimizing the use of energy. Use of a high-pressure reciprocating pump with external bladders makes the vehicle similar to the ALACE floats (Davis et al., 1992).